Meaningful communication, so that the computer understands what people are entering and people understand what the computer is presenting or requesting. The system should present information clearly to the user. This means having an appropriate title for each display, minimizing the use of abbreviations, and providing clear user feedback. Inquiry programs should display code meanings as well as data in an edited format, such as displaying slashes between the month, day, and year in a date field or commas and decimal points in an amount field. User instructions should be supplied regarding details, such as available function key assignments. In a graphical user interface, the cursor may change shape depending on the work being performed. Users with less skill in using the computer or doing their tasks with a computer require more communication. Web sites must display more text and instructions to guide the user through the site. Intranet sites may have less dialog, because there is a measure of control over how well trained users are. Internet graphics should have pop-up text or roll-over descriptions when images are used as hyperlinks, because there may be uncertainty in interpreting their meaning, especially if the site is used internationally. Notice that EU guidelines for the display of Web graphics requires that all images be labeled, so that visually impaired users will be able to hear written descriptions announced through special software. Status line information for GUI screens is another way of providing instructions for users. Easy-to-use help screens should be provided. Many PC help screens have additional topics that may be directly selected using highlighted text displayed on the first help screen. These hyperlinks are usually in a different color, which makes them stand out in contrast to the rest of the help text. Remember to use icons or text in addition to color coding in order to reach the largest number of users. Many GUIs incorporate tool tip help, displaying a small help message identifying the function of a command button when the cursor is placed over it. The other side of communication is that the computer should understand what the user has entered. Hence, all data entered on the screen should be edited for validity. Keying codes, such as airport codes when making a flight reservation, instead of whole words on entry screens. Codes are also keyed when using a command-language interface, such as a two-letter state postal abbreviation. 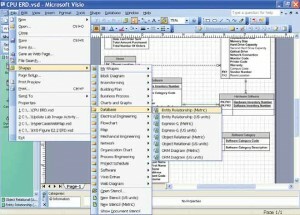 On a GUI screen, the codes may be entered by selecting descriptions of the codes from a pull-down list of available options. This helps to ensure accuracy, since the code is stored as a value of the drop-down list, as well as helping to provide meaningful communication since descriptions that are familiar to the user are selected. An example would be selecting a Canadian province and having the two character postal code stored. Entering only data that are not already stored on files. For example, when changing or deleting item records, only the item number should be entered. The computer responds by displaying descriptive information that is currently stored on the item file. Another example is when a user logs on to a Web site, the user ID is used to find related records, such as a customer record, outstanding bills, orders, and so on. Supplying the editing characters (for example, slashes as date field separators). Users should not have to enter formatting characters such as leading zeros, commas, or a decimal point when entering a dollar amount; nor should they have to enter slashes or hyphens when entering a date. In general, Web sites are an exception to this rule, since Web forms do not include slashes or decimal points. Some Web forms use a series of entry fields with editing characters between them, such as parentheses around an area code. Using default values for fields on entry screens. Defaults are used when a user enters the same value in a screen field for the majority of the records being processed. The value is displayed, and the user may press the Enter key to accept the default or overtype the default value with a new one. GUIs may contain check boxes and radio buttons that are selected when a Web form or dialog box opens. Context-sensitive menus appear when an object is clicked with the right mouse button. These menus contain options specific to the object under the mouse. Designing an inquiry (or change or delete) program so that the user needs to enter only the first few characters of a name or item description. The program displays a list of all matching names, and, when the user chooses one, the matching record is displayed. Providing keystrokes for selecting pull-down menu options. Often, these options are selected using a mouse, followed by keying. Users must move their hands from the keyboard to the mouse and back. As users become familiar with the system, shortcut keystrokes provide a faster method for manipulating the pull-down menus, because both hands remain on the keyboard. This helps users become efficient at their tasks. On a PC or Mac, keystrokes usually involve pressing a function key or the Alt key followed by a letter. Figure 14.15 is an example of nested pull-down menus. Use radio buttons and drop-down lists to control displays of new Web pages or to change Web forms. For example, when a radio button is clicked, a drop-down list may change to reflect the radio button choice. A radio button may be clicked and a form may change according to the choice. A drop-down list may change or a radio button may be clicked to move to a new Web page. Drop-down lists are often provided on a Web page for quick navigation; selecting a new Web page from the drop-down list takes the viewer to that page. Provide cursor control for Web forms and other displays so that the cursor moves to the next field when the right number of characters has been entered. An example would be when a user enters an area code for a U.S. telephone number, and, following the entry of three characters, the cursor then moves to the local phone number field. Entering software registration key codes is another example. The codes are often in groups of four or five letters and, when the first field is filled, the cursor moves to the next field and so on. The analyst should examine every field to see whether automatic cursor control should occur. Any combination of these eight approaches can help the analyst decrease the number of keystrokes required by the user, thereby speeding up data entry and minimizing errors. 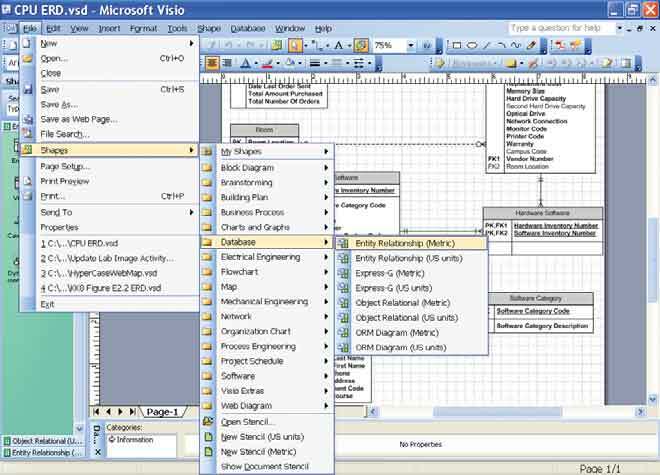 Example of nested pull-down menus with shortcut keys from Microsoft Visio Professional. Locating titles, date, time, and operator and feedback messages in the same places on all displays. Exiting each program by the same key or menu option. Canceling a transaction in a consistent way, such as using the esc key. Obtaining help in a standardized way, such as using a function key. Standardizing the colors used for all displays or Web pages. Standardizing the use of icons for similar operations when using a graphical user interface. Using consistent terminology in a display screen or Web site. Providing a consistent way to navigate through the dialog. Using consistent font alignment, size, and color on Web pages.